The first Longfellow Energy Fair is coming up on Saturday, February 7. The Fair will be at Holy Trinity Church at 2730 East 31st Street, from from 8:30 a.m. to 3 p.m. This event is a great opportunity to learn more about saving energy, saving money, and reducing your carbon footprint. It also aligns with the work of the Hiawatha CARE project, by helping people take action to address air quality and sustainability in their communities. Check the project website for more information, including program details and registration. The Longfellow Community Council is hosting a community “picnic” to re-imagine the area’s underused green spaces. 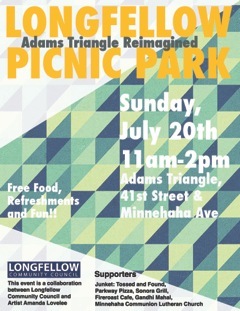 The Longfellow Picnic Park will be happening at Adams Triangle on Sunday, July 20th from 11 am to 2 pm. Bring a picnic and invite your friends. Share ideas on what would make the Triangle a great community space. There will be food, activities, and a raffle with prizes from local businesses. Check this link or the flyer below for more information. Adams Triangle is one of several green spaces within the Minnehaha-Hiawatha corridor identified in the Strategic Investment Framework as an opportunity to create civic or community spaces in the area.